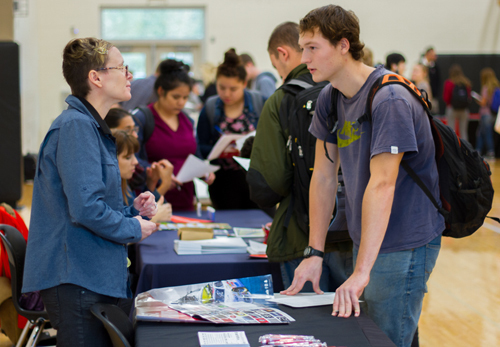 Mary Ann Sturdivan, Woodland High School’s Career and College Guidance Specialist, organized the fair including inviting school representatives from Washington and Oregon. Sturdivan ensures Woodland High School prepares students for life after high school by organizing school events like the College Fair, helping students prepare their culminating projects, and handling a myriad of other responsibilities involving managing graduation requirements, applying for higher education, or training for careers after high school including job hunting and practicing for job interviews. Students attended the College Fair as part of their High School and Beyond plan, a plan designed to guide students through thinking and planning what they want to do after graduation. At the fair, students spoke to representatives from at least three post-secondary organizations and filled out a College Fair Profile detailing what they learned. Students researched each organization’s location; average class size; tuition pricing; housing and book costs; types of scholarships or financial aid offered; job placement assistance following program completion; various degrees and programs offered; and top three admissions requirements. As part of their High School and Beyond Plan, students spoke with representatives from at least three post-secondary organizations, learning about admissions requirements, financial aid, school costs, and much more. Principal John Shoup recognized the College Fair as another in a long line of significant contributions organized by Sturdivan to help prepare Woodland High School’s students for graduation and life after high school. "Mary Ann is amazing to watch managing all the moving parts of these events – all of which go so smoothly," he said. "In addition to the College Fair, there has never been a student who failed to graduate as a result of missing the mark on their culminating project since Mary Ann started with us more than four years ago – a significant statistic." Students were engaged through the fair with representatives from the various organizations reporting the event was a huge success.